Still going thru old magazines, but sturck on the idea of adding any lineup/results I get every 10 issues. They were added on Thursday. I’m using my long forgotten tumblr account to post notes and snippets of issues if I see something interesting, though there’s not one there every week. The biggest story around this time period is Mil Mascaras finally debuting in Arena Mexico. He’d been rejected for a license the year prior and had spend the time touring around Mexico. He’s immediately on top, teaming with the top tecnicos. Lucha Libre, who created the character and have been running ideas for his masks ever week for the last year, are strongly advocating for him as the soon to be greatest star of lucha libre. 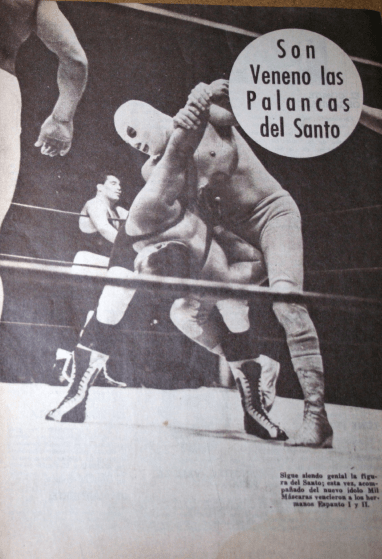 Interestingly, they’re saying that title goes from El Santo to Medico Asesino to Mil – Medico’s place in that linage has been forgotten as his promotion has faded into obscurity. The Friday night shows are built around Rene Guajardo & Karloff Lagarde (as the lead rudos and team) and Ray Mendoza (as the lead tecnico, freshly promoted to that role), with others coming in and out. There’s a tease of a three way match, but instead Mendoza takes Lagarde’s hair on July 30th, and Guajardo avenges his tag team partner on August 20th. Both are said to be sell outs. The strangest story to me is how Lagarde ends his seven year world welterweight championship reign. 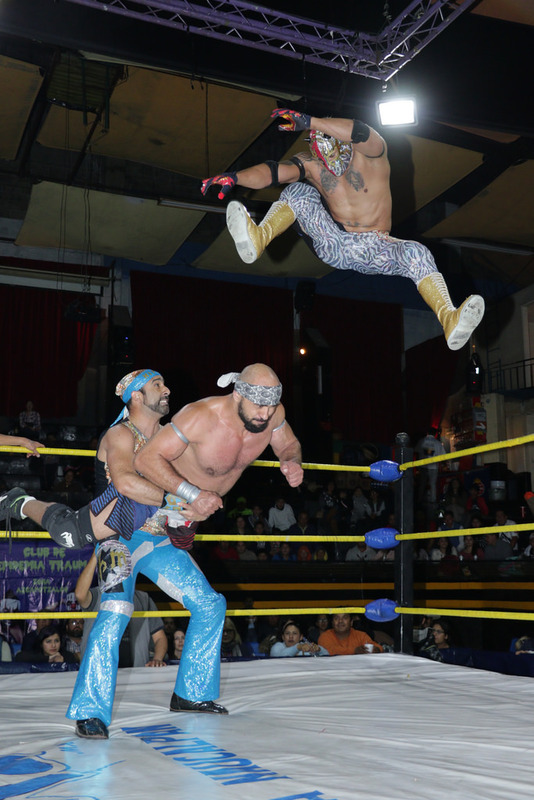 Huracan Ramirez wins the title for the first time in the now demolished Arena Isabel of Cuernavaca, on an anniversary show for the building. Except, Huracan doesn’t really win it as much as receives it, when Lagarde is disqualified in the third fall for excessive violence. Titles change hangs on DQs, so Huracan wins the belt because his opponent beat him too much. Such an odd way to do it, and they didn’t do it for a long reign – Lagarde wins the title back in the next few weeks after the ones I’ve covered here. Ramirez has a tour of Guatemala while he’s champion, maybe they simply wanted him to be champion while he was there. You can see the ‘current’ Arena Mexico/Arena Coliseo lineups and results after the cut. Golden Magic and Trauma II feuded. Imposible was hurt and left the match in the first fall. Mascara 2000 Jr. just happened to be there (and in his gear!) so he replaced him. Silver King Jr. interfered to attack Mascara for the DQ. Tonight’s Arena Puebla show has Atlantis, Caristico and Dragon Lee taking on the Hijos del Infierno in a rematch of last week. It seems like a setup to a trios title match, though they could pivot into it being for Mephisto’s title or just a non-title singles match. It does hint the Hijos del Infierno are both not winning the world trios title and not giving up their national titles (this has the markings of a thing we talk about for two weeks which goes nowhere), but we may have a better idea about that tonight. The rest of the card is a mixed bag. The tercera has Drone, Esfinge and Lestat and Puma, Tiger and Skandalo. Skandalo’s not good, but he does seem to be less of a focus when Stigma isn’t in a match. This match comes off as if Lestat’s only getting this spot because Stigma isn’t around for whatever reason. The rest of the guys are good and could put together the best match of the night. The other stuff is not as interesting: another Diamante Azul/Pierroth trios in the semimain, a women’s tag match including some people who aren’t great, and an opening match focusing on the Espiritu Maligno & Policeman feud. They’re headed to a hair match soon, maybe as soon as next week. CultIcon also previews the show. Tonight show starts four weeks of CMLL streams airing an hour later due to US starting Daylights Saving Time a month earlier than Mexico. That means tonight’s CMLL Puebla show will start 9pm locally, but 11 pm Eastern in the US, and 10pm Central. On the latest Podcast Boom, Konnan claims AAA’s trying to get many veterans to join in. Konnan mentions the Mr. Aguila, Damian, Halloween, as he has on other podcasts, with the idea that the original Perros del Mal would be part of the group again to legitimize it. Konnan mentions LA Park, and Park has referenced rumors of him going to AAA on his Twitter (mostly on the idea he’d go if they gave him enough money, but it doesn’t sound close.) New Konnan claims this time is Maximo, La Mascara and Rush. Maximo’s had several times of coming close to leaving CMLL in the past, but has always been convinced to stay. (When he was in charge, Konnan himself was frustrated by these teases and said he’d no longer to talk to Maximo about coming to AAA after it fell thru last time.) Rush & La Mascara seem to have a lot of freedom in CMLL and would seem to have to be convinced AAA’s a much better deal. For what it’s worth, CMLL owns the rights to trademark for “Rush”. They filed for La Mascara in 2010 but it’s never been approved (maybe because other people used it longer before CMLL.) CMLL also files for Los Ingobernables in 2014, which hasn’t been approved yet. I don’t think there’s any real chance they’re going to AAA. Dragon Rojo kept the CMLL Middleweight Championship over Delta in Arena Pavillon del Norte. TKD reviews a disappointing July 11, 2015 Cara Lucha show. Matt Taven is sticking around at least all weekend. He’s also suddenly a tecnico, probably because he’s facing Ultimo Guerrero on Friday. Semimain should be really good. Okumura might be back from injury by this point. Dragon Lee vs Niebla Roja on a not taped show for the second time. Opener might be a match Principe Diamante can win. Seems less likely for Astral. Fantastico is a new name here (though there’s plenty of people who’ve used that name elsewhere.) Not sure why there’s a rudo vs rudo match, or if this is the old CMLL Tigre Blanco or if that name’s being recycled. What happened: Cavernario defeated Cometa in the main event to set up a title match between them next week. What was good: I liked the third and fourth matches, and the main event was an effective set up for next week.